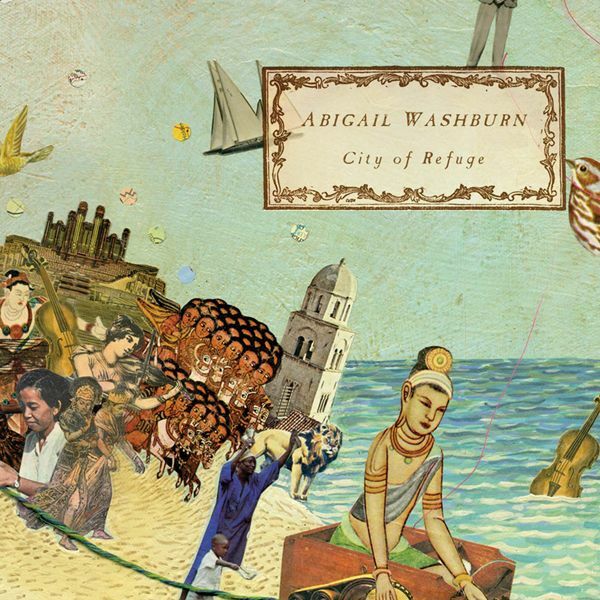 In a word, Abigail Washburn’s City of Refuge shines. It is a folk-pastiche that draws on all of Washburn’s past successes and crafts them together into a lovely and sometimes mysterious work of art. The album achieves this success, I think, by maintaining the balance that Washburn has achieved on those previous releases between traditional old-time clawhammer banjo playing and a progressive blending of American and Chinese cultural folk styles. City of Refuge, however, pushes that mix into a new and rich melodic space. It’s a record fit for long-time fans of old-time and bluegrass but also one equipped to make a mark with new audiences anxious to push a little on the boundaries of a now decade-old indie folk scene. Over the last several years, Washburn has made a name for herself playing banjo in the clawhammer style, as a string-band aficionado, and as a songwriter and curator with a unique and striking voice. In addition to her 2005 solo release, Song of the Traveling Daughter, her previous projects include work with the all-female string band Uncle Earl and a more recent project with masters Bela Fleck (to whom Washburn is married), Ben Solee and Casey Driessen called The Sparrow Quartet. Perhaps most distinct of all, however, is Washburn’s use of Chinese folk imagery and instrumentation. She was an East Asian studies major and spent time living and working in China before nearly taking a position at a law school in Beijing. That Chinese influence and sound might be what is most remarkable about City of Refuge. See, for example, “Corner Girl” which features traditional Chinese instrumentation which is then followed by “Dreams of Nectar” with its remarkable interplay between the styling of an American spiritual and a Chinese folk song. That said, the record’s pop sensibilities, its often easy and rolling melodies such as those on the title track, are what endeared me to it almost immediately. See also “Chains” — which has a Fleetwood Mac vibe — and “Divine Bell,” which wouldn’t be out of place in a set by Asleep at the Wheel. And even though the tunes are singable, Washburn’s voice haunts each track and pulls the listener along beside the drone of her banjo. Finally, each of the songs proclaims the record’s success as a collaborative project. Tucker Martine (noted for his work with Sufjan Stevens, the Decemberists, Laura Veirs) produced, Kai Welch helped with the writing, and other notable guests include guitarist Bill Frisell, fiddler Rayna Gellert, and guzheng (the ancient Chinese zither) master Wu Fei. Also, Chris Funk (Decemberists, Black Prairie) and Carl Broemel (My Morning Jacket) can also be heard on what I think is a nearly flawless record. Listen soon.